임실 필봉농악은 필봉리에 전승되고 있는 농악으로 호남좌도농악에 속한다. 필봉마을에는 예로부터 당산굿·마당밟기 정도의 단순한 농악이 전승되어 왔는데, 오늘날과 같은 높은 수준이 된 것은 1920년경에 상쇠(패의 지도자 격으로 꽹과리를 가장 잘 치는 사람) 박학삼을 마을로 초빙하여 그의 농악을 배우면서부터라고 한다. 필봉농악의 농악수들은 흰 바지저고리에 남색조끼를 입고 삼색띠를 두르는데, 쇠잡이(꽹과리나 징을 치는 사람)만 상모(털이나 줄이 달린 농악에서 쓰는 모자)를 쓰며 나머지는 고깔을 쓴다. 농기, 용기(그릇), 영기(깃발), 긴 쇠나발, 사물(꽹과리, 징, 북, 장구), 법고(불교의식 때 쓰는 작은 북), 잡색(대포수, 창부, 양반, 조리중, 쇠채만 든 농구, 각시, 화동과 무동)으로 편성된다. 농악의 종류에는 섣달 그믐의 매굿, 정초의 마당밟기(풍물을 치며 집집마다 도는 것), 당산제굿(당산에서 마을을 위해 제사지낼 때 농악을 치며 노는 것), 보름굿과 징검다리에서 치는 노디굿, 걸궁굿, 문굿, 농사철의 두레굿, 기굿과 판굿이 있다. 이 중에서 판굿은 가장 예술성이 뛰어나다. 뒷굿에 편성되는 영산가락은 가진영산, 다드래기영산(상쇠가 부포시범을 보임), 미지기영산, 재넘기영산(상쇠가 쇠시범을 보임) 및 군영놀이영산(개인놀이와 비슷함)으로 매우 세분화되어 있고 느린 편이다. 임실 필봉농악은 쇠가락(농악의 대표격인 꽹과리 가락)의 맺고 끊음이 분명하여 가락이 힘차고 씩씩하며, 개개인의 기교보다 단체의 화합과 단결을 중시한다. As nongak (farmers’ music) that has been handed down in Pilbong, Imsil, Imsil Pilbong Nongak belongs to Honam Jwado Nongak (Farmers’ Performance of the Western Jeolla-do). Simple farmers’ music such as that performed on occasions like dangsangut (rite to village guardian) or madang bapgi (treading on the courtyard) had been handed down in this village. The music is said to have become sophisticated around 1920 when the villagers started learning the performing skills from Park Hak-sam, who served as sangsoe (leader of a farmers’ music troupe). The members of a farmer’s music troupe wear white jacket and trousers, with blue vest over the jacket and bands in three colors tied to the head. 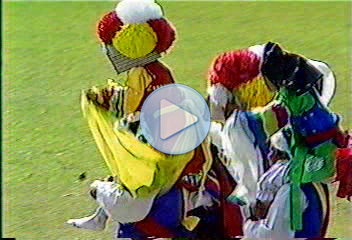 As for the headgear, only the soejabi (gong player) wears sangmo (hat with feathers or strings attached); others wear gokkal (conical hat). 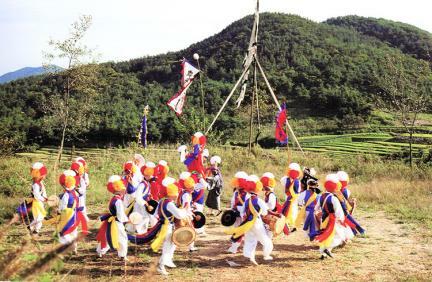 A farmer’s music troupe is composed of yonggi (dragon flag), nonggi (farmers’ flag), long soenabal (trumpet), samul [four percussion instruments, i.e., two kkwaenggwari (small gongs), two jing (large gongs), two buk (drums), and four janggo (hourglass-shaped drums)], beopgo (Buddhist drum), japsaek [referring to a group composed of yangban (nobleman), daeposu (drummer), jorijung (masked clown), changbu (male clown), gaksi (young girl), hwadong (young girl) and mudong (dancing boys)]. The local farmers’ music has many versions according to different occasions: maegut (village ritual held on New Year's Eve on the lunar calendar), madang bapgi, dangsanjegut (rite to village guardians), duregut (performance for villagers’ unity), and pangut (entertainment-oriented performance). Among them, Pangut showcases the best artistic quality. The Yeongsan rhythms contained in the local farmer’s music in Imsil are slow with have many variations, such as gajin yeongsan, dadeuraegi yeongsan, mijigi yeongsan, jaeneomgi yeongsan, gunyeong nori yeongsan, etc. The local farmer’s music in Pilbong, Imsil features clear-cut rhythms of kkwaenggwari (small gongs), powerful/gallant rhythms, and emphasis on teamwork rather than individuals’ skills.